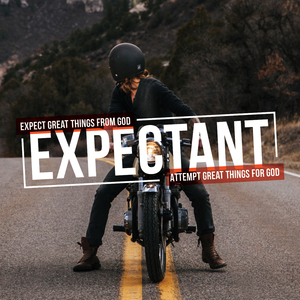 God wants us to be more expectant of Him! His Return. Early Christians would greet one another with the word “Maranatha”- meaning “The Lord is coming”. His Kingdom coming on earth. Jesus taught us to pray and expect that. His personal provision. We pray for him to give us daily bread. Expectant people are normal people with normal reactions and emotions. When Paul came to Corinth he said “I came to you in weakness with great fear and trembling”, yet in that mix of emotion he had confidence in “Christ crucified” and “the Spirit’s power”. A Church for all people. A church for all Edinburgh. A church where all of us are all in for Jesus with our hearts and lives. It’s a huge vision! Impossible without God’s help. The story of David and Goliath teaches some important lessons about growing in Expectancy. David conquered 5 other giants in 1 Samuel 17 before he approached Goliath. In every underdog story there’s a backstory. It’s no different for David. But what might surprise you is there’s always a back story. Expectant people do more than wait around! Discouragement from his own side! His brother misinterprets his motives. David ignored it. That’s a valuable lesson for us when we face personal discouragement that prevents us from doing what God wants. David knew how to find strength in God, not in others views. Expectant people ignore discouragement. Verse 33 Saul replied, “You are not able to go out against this Philistine and fight him; you are only a young man, and he has been a warrior from his youth.” When surrounded by experts in warfare, young David wasn’t paralysed by his lack of title or job description. Many of us wait for the title before we take any action. Expectant people are not defined by education or skill-set. But by who God says they are. Verse 32 David said to Saul, “Let no one lose heart on account of this Philistine; your servant will go and fight him.” Everyone was waiting for someone else to deal with Goliath. But Nobody did until Somebody would. God is looking for a person to partner with. Someone who will says Yes Lord. Expectant people say Yes to God. Expectant People Trust God more than what they see. Verse 38-40 Then Saul dressed David in his own tunic. He put a coat of armour on him and a bronze helmet on his head. David fastened on his sword over the tunic and tried walking around, because he was not used to them. “I cannot go in these,” he said to Saul, “because I am not used to them.” So he took them off. Then he took his staff in his hand, chose five smooth stones from the stream, put them in the pouch of his shepherd’s bag and, with his sling in his hand, approached the Philistine. We get immobilised when we try to be not us. Expectant people don’t copy other’s styles or gifts but pursue Christ conformity, and expect God to use them with theirs. When trusting God to build a church for All, for All Edinburgh and where All of us are All in for Jesus we will face all these giants. But like David we must overcome these to see the success God wants to bring. Creating two equally accessible Sunday church meetings (10:30 am and 6 pm) to include the same preaching at both, making them accessible to people with different availability and choice. Events that we can broadly invite anyone to as a first step towards Jesus. E.g. Tony Vino night. Events that facilitate mixing and diversity- e.g. church lunches. Groups that focus on particular demographics e.g. new youth small group, student groups etc. Serving specific community groups. Homeless shelter, Tots, Evergreen café, Hub104. Creating disabled access to our building (in progress, watch this space). We are a church gathered from all over Edinburgh. We have a heart not just for the locality around our building but for everywhere in this city. We want to see small groups starting in all parts of Edinburgh, and to get more strategic about that. Our mission for Jesus is represented in our homes, streets and workplaces. We want to profile this more using our “This Time Tomorrow” spotlight. We want to use our homes to invite in those who don’t yet know Jesus. E.g. December with mulled wine and mince pies parties. Like the early church we want it to be said of us “They devoted themselves”. We want every member of King’s to keep knowing God better and serving him through subsequent seasons of life (and capacities) and growing in leadership and influence. Courses like Alpha to help the unchurched. POD to help with the basics. Academy to help leadership development. Creating space for leadership growth in King’s by being generous with sending people (e.g. planting in West Lothian, sending George to Berlin). Which of the Five Giant ‘D’s do you think most intimidates you in becoming the person that God intends? How does the story of David help us grow in Expectancy? What challenge and opportunity does each of these vision statements provide for us a) Personally and b) as a small group? Church where all of us our all in for Jesus.